How often do you have babies? We babies born every week so we have new babies that are ready to go each week. How old are the babies when they are ready to go? Almost all of our babies are ready to go by six weeks of age. We always make sure babies are eating and drinking well on their own and are an appropriate size before letting them leave. We try to have babies placed in new homes by the time they are 12 weeks old. There are times when babies have a lengthy quilling stage and are friendlier after the bulk of their quilling is complete. These hedgehogs may be older than 12 weeks. As always, you will have a choice of hedgehogs when you come. There is a hedgehog that I am interested in, but what if I don’t bond with that one? Can I put my favorite on hold and see how we react to each other? 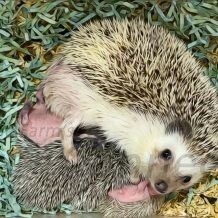 Or should I just come and see the different hedgehogs that you have available and then pick one? We suggest putting your deposit on your favorite. When you come you are welcome to meet and handle any other available babies. If you like another one better, you can choose that one. Reserving your favorite assures that you are not disappointed when you come.